The Renaissance building was built on the site of an ancient church of early Christian origin dedicated to St. Mary and later, after the transfer of the Plebani rights, around the year 1000, within the walls of Castellane, in San Biagio. At the beginning of the sixteenth century, only a few remains were preserved; In a wall there was still a fresco with the Madonna and Child and St. Francis, the work of the fourteenth century Sienese, to which in the 1518 were attributed miraculous events. The echo of this devotion develops well beyond the area of the Valdichiana: in 1519, for example, the town of Sansepolcro decides to participate in the expenses of the pilgrimages that the companies and the people of the city will support to go on pilgrimage to the Madonna of San Biagio, to which already many communities have sent gifts. 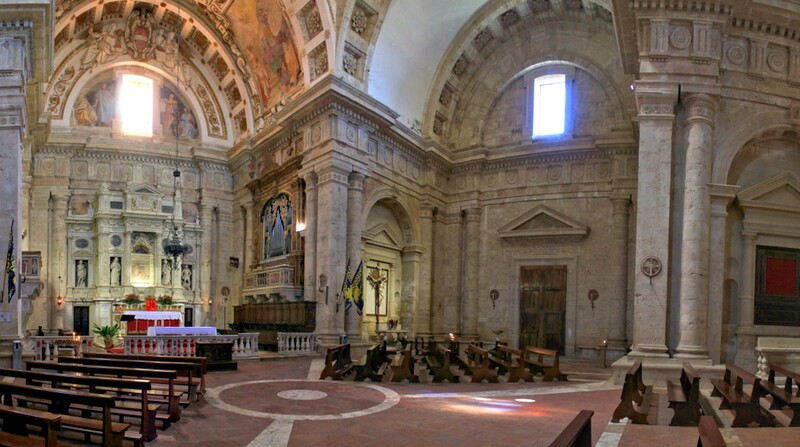 The people of Poliziano decided to erect a new church by entrusting the assignment to Antonio da Sangallo the Elder. He designed an imposing central plant building and the ambitious project was supported by Pope Leo X, who had been educated by Agno, a native of the Tuscan town. The construction of the temple continued until the 1545 and the works were directed, after the death of the designer, by other superintendents. The body that built the church was the work of San Biagio, today merged in the Fabbriceria of the ecclesiastical works gathered in Montepulciano.